Since the early days of hockey in Minnesota, small towns have played a big role in the culture and tradition in the State of Hockey. In fact, small towns dominated the first 25-plus years of organized hockey in Minnesota. Only one metro area team (St. Paul Johnson) won a title at the boys state high school hockey tournament through its first 24 years, as communities like Eveleth, Roseau and International Falls dominated headlines at the youth and high school levels. As society changed and more people congregated in urban areas, hockey participation in the Minneapolis-St. Paul metro area grew at an incredible rate and eventually resulted in new hockey powers. Wayzata Youth Hockey Association, for example, held its inaugural season in 1968-69 and is celebrating its 50th anniversary this season. While numbers were modest when they started, Wayzata now provides a hockey experience for over 1,000 players, which rivals what some small associations have for total population in their community. Certainly, much in the hockey landscape has changed over time, but the pride and passion for small town hockey in Minnesota has not. We sat down with Baudette native Alex Lyon, who is the second player from Lake of the Woods Youth Hockey to play in the NHL in the past 10 years and Brian Halonen of Delano to hear more about what makes growing up in smaller Minnesota communities still so special. There are few places in the country, and even the world, in which small communities rally around hockey like they do in Minnesota. It’s a deep-rooted part of the culture that has been passed from generation to generation for over a century. Hockey’s place in the roots of communities isn’t just found in prominent hockey communities or northern Minnesota. Recent success has brought a spotlight to towns like Luverne and Delano, which may not have the same history as other parts of the state, but they display a similar passion for the game and their teams. That type of support creates a special experience, one that has been inspiring kids in Minnesota for decades. Editor’s Note: There is a total of seven indoor ice sheets in the three communities of Roseau, Warroad and Baudette for a population of roughly 5,500 people. 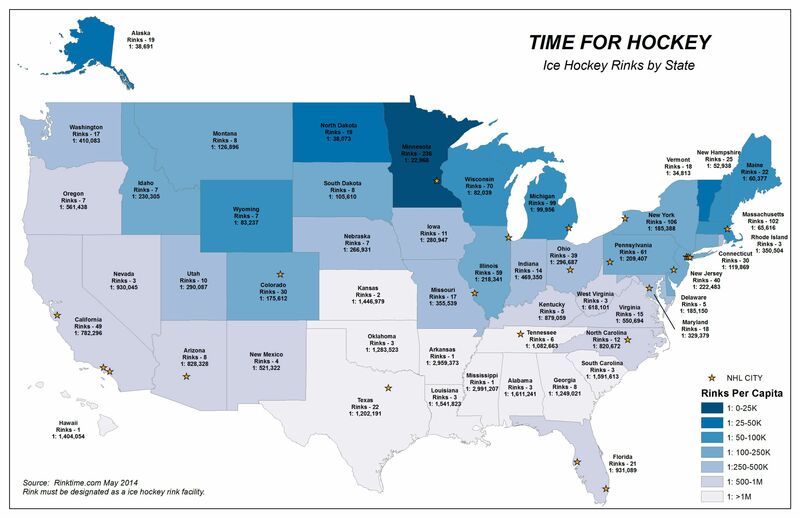 Meanwhile, there were 19 U.S. states with seven or fewer total ice arenas in 2014 according to Rinktime.com. The Minnesota Boys State High School Hockey tournament undoubtedly plays a huge role in driving the passion and community support found in small communities. For those who are able to climb the mountain and experience the “Tourney”, it becomes a memory they’ll never forget. Whether it’s being exposed to other perspectives and backgrounds through teammates in junior hockey or becoming engrained in another community while in college, players learn quickly how different life can be in other parts of the country and world. In most cases, that new perception comes with two distinct realizations when it comes to hockey. The first is there are some pretty unique experiences and impressive training programs in the hockey world. The second is a feeling of gratitude for the environment they grew up in. Halonen echoed Lyon’s view, noting the stories he heard about other parts of the country fueled an even deeper sense of pride and appreciation for growing up in Delano. Certainly, small towns, and Minnesota in general, have their own challenges, but whether players simply want to play for fun or if they want to strive to play the game at its highest levels, they can achieve their goals from anywhere in the state.